Before you embark on a fun-filled Father’s Day on the water, check out West Marine boating safety expert Chuck Hawley’s quick tips for smooth sailing. 1. 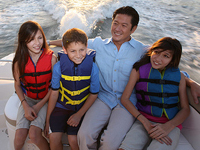 It’s common knowledge that the best way to make boating safer is to have everyone wear a life jacket. There are two groups of boaters where it’s really, really important: kids under 13 and non-swimmers. Before you set sail, ask if there are any non-swimmers on board, and make sure all of the kids have appropriately-sized vests. 2. A small medical kit is always a good idea. For less than $50, you can buy a kit in a waterproof container that has a good assortment of bandages, dressings, pain meds and antiseptics. For longer trips or larger groups, you may want to consider a more comprehensive medical kit. 3. While not specifically in the "safety" category, any boat can benefit from the addition of some waterproof binoculars for identifying navigation aids, harbors, and seeing vessels that might require assistance. 4. It just makes sense to check the weather before you head out, and monitor the weather while on the water. VHF radios and the ever-present smart phone can provide advance warning of inclement weather. 5. Does your bilge pump run frequently? Engine hard to start sometimes? Battery doesn’t hold a charge for very long? These are not-so-subtle messages that perhaps you should do a little boat maintenance before shoving off. 6. I know guys don’t like to ask for directions, but we’ve got to get over it. When on the water, it just makes sense to have appropriate marine charts (or perhaps a chart booklet) and a GPS. When it gets dark or foggy, you’ll be so much happier than being without. 7. Boat shoes are different for a reason: they don’t leave marks, they provide a good grip on dry and wet surfaces, and they make you look like a boater. Unfortunately, not everyone shows up with boat shoes on, and you should avoid having them run around barefoot if you want to avoid foot injuries. Make sure your guests bring along shoes with non-marking soles. 8. Keep your speed under control, especially in heavily-trafficked waters. If you’re not sure of the other guy’s intentions, slow down and assume that he doesn’t know the \\\'Rules of the Road\\\' as well as you do. This is especially true at night when navigation lights can be lost in the surrounding lights onshore. 9. Be conscious of the boats around you. It’s a basic law of the sea to lend assistance to those in need. Monitor the radio, look for flares and other signs of distress, and keep an eye on boats that seem to be not entirely under control. 10. Don’t forget the sunscreen! The reflection from the water amplifies the sun’s intensity putting you at greater risk for burning. Make sure to reapply your sunscreen throughout the day, especially after swimming. This goes for any activity on or off the water. Chuck Hawley is a life-long sailor, having grown up on the California Coast. He has sailed approximately 40,000 miles on vessels ranging from ultralight "sleds" to single-handed sailboats to the maxi-catamaran PlayStation. 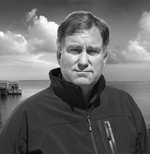 Chuck has worked for West Marine for 30 years, and is responsible for many of the West Advisor articles that appear in West Marine’s catalogs. He is also Vice President of Product Information. Chuck, his wife Susan, and their five daughters have spent many a Father’s Day enjoying the freedom that getting out on the water affords.